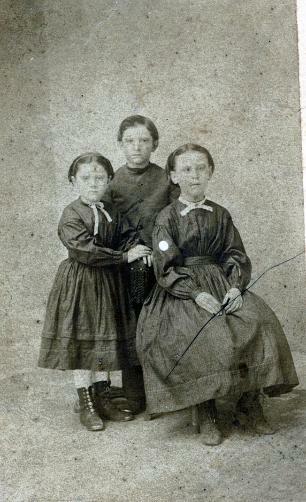 Three children in c.1860s dress. "Whatever thy hand finds to do, do it with all thy might." understanding a little about what their lives were like. taught 4 levels: Early elementary, upper elementary, middle school, and high school students. study, although I do not advance any particular denomination's interpretation. sections on sickness, poverty, and other difficult topics. information and suggestions than you need, so that you may pick and choose. I created just for this project. God Bless you as you teach your precious children! Click on the link in blue to go to the pages. I like unit studies with everything included, but some people like lots of supplemental materials. and also a list of possible activities for your planning convenience. very end of this section. books very disturbing and some of the characters emotionally abusive. art, etc. These books are often very inexpensive, and can add a lot to your study. Dover publications historical paper dolls are great for little girls.....and boys, too. B. Start planning field trips and activities. historical events do NOT happen in a vacuum, but usually result from events that happen before. B. Acquire a folder, folders or binder(s) if you wish to create a lap-book or binder for this information. D. English: Most sections will have English practice pages. you can also use a copy of Ray's Arithmetic to give a 19th century feel to your lessons. source. As you study certain regions, the student can also locate and color the appropriate state. G. Be sure that students have access to a good dictionary if they are looking up vocabulary words. about her life. They can report orally or in writing, or create a Powerpoint Presentation. compare your family to 19th century families. B. If you are doing the lap-book, have the pages printed out. adoptive parent, I have included some information on adoption at the end of this lesson. students thinking about how life might have been different for people from different social groups. That wrong interpretation of the Bible was used to support racism. negative thing for a Christian. wilderness. How far do you think you could go in a day? B. You might want to use a large piece of paper to make a comparison chart of the different means of travel. to hear that sound if you were alone in the wilderness. walks a little faster, but even a running horse is much slower than a car's highway speed. this information to make a graph or chart. F. If your children are interested, try to find some books or websites on meterology. book is apparently currently out of print, but you may be able to find a copy in a resale bookstore or at Amazon. home, or write a paragraph about it and its history. simple huts without electricity, or even in “houses” made of cardboard and scavenged materials. mixture. Children could even do this with sticks and mud in the yard. A. Prepare a “common” southern meal of hot water cornbread, turnip greens and black eyed peas. C. Churn butter using one of the methods described in this section. F. Make “light” bread or corn bread from scratch. H. If you have a grist-mill in your area, you might arrange a visit. B. Plant a seed or even a small garden, if you do not normally grow a garden. C. Weeding or hoeing: Have children try to hoe up an area. It’s hard work! This is what settlers without a plow had to do. (Left). To make them walk forward, the farmer might say “Walk on” or “Gee up!”. “Whoa” means to stop. Play this game like Red Light-Green Light. Students stand in a line in front of you, and you give the command. This is a great way to use up children's excess energy, and they think it's funny. “drive” the horse. Children often really enjoy this. print or draw a sheep shape on regular paper, draw a background, and let children put cotton balls on it. Storey's Guides. These books cover many different types of farm animals, and they are a great resource. There are also plenty of books about many types of domestic animals available at your local library or bookstore. You may wish to combine this lesson with the Fashion lesson, or skip the Fashion lesson. A. Visit a local cotton field, gin, or a farm that raises sheep. B. Try to find a person who spins, or watch a spinning or weaving demonstration on YouTube. “spin” a short thread from a cotton ball. D. Introduce children to knitting or crochet. E. Purchase different types of fiber from stores (like The Woolery) that cater to hand-spinners. form “quilt blocks.” Or, draw or copy quilt block patterns for them to color. from a hobby-store or one of the old "pot holder" type looms. ends of the bolts. Discuss with them why different types of fabrics have different care requirements. necessary), compare them to the original measurement. react to flame, and why synthetics are dangerous to wear around an open fire. the mordants needed. In a pinch, children can dye a piece of fabric, and often themselves, using food coloring. A. Have students look at illustrations of historic costume, or notice historic costume on movies. C. Plan a simple sewing project, such as an apron or pillow case. fabric with Rit dye or even natural dyes if you wish. Then cut the fabric into long strips and braid them together. around and sew them into a rug. B. Older students can practice ironing, with adult supervision. C. Show older children how to starch clothes. gallon of water you used, how would it change the way you cleaned and bathed? God by including Christian symbols. appropriate for Senior High students. C. Study medicinal herbs in your area. Discuss what these herbs were/are used for. There is a documentary entitled Triumph at Carville about this subject. deaf-blind, such as Laura Bridgeman and Helen Keller. H. Let children transcribe their names into Braille or learn their names in sign language. interesting, and raises many questions about an individual's civil rights. C. Have children try to write with a quill pen or a dip-pen and ink. Try some of the Spencerian script. E. If your town's museum or library has old newspapers on microfilm, let students read some of the articles. F. If your family has any old documents, show them to your children. languages, show examples of these to the children and even have them try to copy some words. schoolwork without paper. What changes would need to be made? I. Let students transcribe their names into Morse Code. A. Be prepared to discuss your denomination's beliefs with your children. When did your denomination begin? Where? What are some key beliefs that differentiate it from other Christian denominations? taught at singing schools. You can also listen to other hymns, and learn about famous hymn-writers. C. Build a model of a brush arbor. This is easily done with a few stick and some branches or brush over the top. going basis. Even the youngest student can make a card for a person in a nursing home. The Farmer in the Dell, Uncle John, Fox and Geese, even checkers or chess. B. Cut paper dolls from paper and let students color them or dress them with crepe paper. porcelain and china dolls were made. You can also buy inexpensive doll heads at many craft and hobby shops. E. Several companies still make metal "toy soldiers". These were favorite toys for boys. There were also "lead"
farm animal sets, circuses, hunting sets. etc. The modern equivalent would be plastic soldiers and farm sets. F. Some hobby and craft stores sell small wooden toys, such as trains, the children might enjoy painting. G. Many stores sell small but functional pans in which younger students can actually bake tiny pies and cakes. part of a metal can) tacked on the end. Rolling hoops and having hoop races is good fun. Bowers, Steve and Steward, Marlen. Country Workshop: Farming with Horses. St. Paul, MN: Voyageur Press, 2006.
it does NOT show different types of farm implements, however. Jones, Katharine M., ed. Heriones of Dixie: Spring of High Hopes. St. Simons Island, GA: Mockingbird Books, 1955. McMillen, Sally G. Motherhood in the Old South: Pregnancy, Childbirth and Infant Rearing. Silverthorne, Elizabeth. Plantation Life in Texas. College Station: Texas A & M U.P., 1986. Flander, Judith. Inside the Victorian Home: A Portrait of Domestic Life in Victorian England. New York: W. W.
Norton & Company, 2004. First American Edition. wonderful compilation of reprints of primary documents. Laskin, David. The Children's Blizzard. New York: Harper Collins, 2004.
classic work on poverty and the lives of tenement-dwellers. has some incredibly illustrated books about 18th and 19th century life. Try to find a copy of this book. are excellent resources. I have listed only a few here, but there are many, many more. Olian, JoAnne, ed. 80 Godey's Full-Color Fashion Plates 1838-1880. Mineola, New York:Dover, 1998. Olian, JoAnne, ed. Victorian and Edwardian Fashions form "La Mode Illustree." Mineola, New York: Dover, 1998. University of Tennessee Press, 1974.
of Illinois Press, 1981. Illini Books Edition. This book covers the period 1870-1920. Lady, A. The Workwoman's Guide: A Guide to 19th Century Decorative Arts, Fashion and Practical Crafts. well as to give patterns to help women who were sewing for the poor. Warren, Mrs., and Mrs. Pullan. Treasures in Needlework. New York: Lancer Books, 1973. This is a reprint of a c.
western sidesaddle riding or historical costumes or riding. It is a VERY short book, but the photos are good. Herlocher, Dawn. 200 Years of Dolls:4th Edition. Iola, WI: Krause Publications, 2009. McClinton, Katharine Morrison. Antiques of American Childhood. New York: Bramhall House, 1970.
of the Fifth Edition. New York: Dover Publications, 1987. Reprint of catalog first published about 1893.
copy through Alibris or Amazon. Vocabulary- Choose which words fit your students' levels. Readings taken from or adapted from primary sources. Some lessons also contain role-playing scripts. do with the topic, but you can use them with your children if you wish. coloring sheet or illustration for a lap book.